YouTube is well known and respected for supporting captions in their online player since 2006 and providing simple tools to add captions. There’s another online video player by Vimeo that is also very popular, but at this time, unfortunately, does not support captions. When Rick Casey posted his first comment 4 years ago on Vimeo Community Forum about adding captioning feature, replies by Vimeo staff had upset so many people, both hearing and deaf, who added their comments on that forum about why captions are important. One of them is Eric Stoller who is hearing, but cares a great deal about captions and accessibility in general and advocates for it. He also wrote blog posts about this issue. In one of Eric’s original blogposts in 2009 – “Vimeo and closed captioning”, he replied to those comments and referenced to other threads in the forum that show Vimeo seems not to care about people who need captions. I hope that Vimeo will finally implement the captioning support for their video player. Meanwhile, if you use Vimeo for videos, please switch to YouTube that offers simple captioning tools or use Universal Subtitles to add captions to existing players that don’t have this feature. 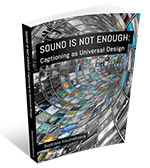 accessibility, captioning, deaf, hard of hearing, vimeo.